This page is one of several on this site about my novel The Ancestor Cell. They are all linked from this main blog post here. Steve Cole and I answered a number of questions for Doctor Who Magazine. Vanessa Bishop then wrote these up into the “Talking Books” item that accompanied her review of The Ancestor Cell. Here are my answers to the original questions. Vanessa Bishop: Was there always a plan for one final book that would ‘tidy up’ the loose ends of the story arc? Peter Anghelides: “Final” is a bit of a worrying word, isn’t it? We want people to see each book as a “stepping on” rather than a “getting off” point. Doctor Who is constantly developing, so I’m not sure I’d want to tidy everything up. 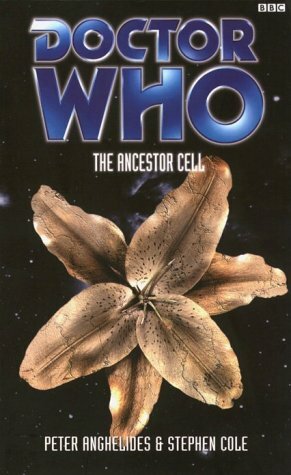 Even shows like “Genesis of the Daleks”, which purport to provide answers and closure, actually open things up more because fans love to speculate—no doubt they’ll spot more dangly bits in The Ancestor Cell. At least we haven’t sunk Atlantis again. What difficulties did you encounter in having so many unfinished plotlines to explain? I didn’t think there were all that many. Each time Steve and I bounced e-mail at each other when working on the outline, we japingly added another thing we wanted to get out of the book. We quickly ran into essential items such as “kitchen sink”, “huge advance on royalties”, and “world peace”. Sadly, we only got the first of those, I think. In the end, it’s more important to tell a compelling story that will grip a casual reader than pedantically to dot every i and cross every t.
Did you feel at all intimidated by the baggage that Time Lords and Gallifrey always bring? Of which aspects of The Ancestor Cell are you most proud? It’s the first thing I’ve co-authored, and it was great fun to do. I can exclusively reveal to you our approach for dividing the writing chores: I wrote all the odd pages. And Steve wrote all the very odd pages. What drove you to such extreme measures at the end of the book? Steve made me do it. He kidnapped my children, and threatened to make them watch “The Happiness Patrol”. Besides, as the book series is undergoing some exciting changes later this year, we wanted to do something memorable in this one. As a story arc contributor, do you feel, in retrospect, that The Ancestor Cell’s explanations should have been given within the arc itself? That would have baffled those readers who don’t collect the whole series. Most of the explanations are derived from clues in the other books, but we wanted there to be some surprises too. What do you feel are the successes of the story arc? People are talking about the book series again, not just individual books. Yet you can read most of the books as an independent novel. Regular readers get a bonus for their loyalty, more satisfying than “buy six get one free”. Highlights of the last year’s books for me are the regular cast: the Doctor coming back to centre stage; Fitz finding his voice; a dangerous new companion in Compassion; and the clockwork canary, of course, which makes a startling reappearance in The Ancestor Cell. I wrote this short article for the Online Ratings Guide, where it was first published in November 2000. You may even find answers to some of the questions elsewhere on my web site. Because I feel that my books should stand or fall on the published version, I’ve been reluctant to provide a kind of Cole’s Notes (aha… do you see what I did there?) for the book by answering specific questions. However, for your delectation and delight, and allowing for some conflation of similar ones, here is my list of “Top Ten Questions about The Ancestor Cell that people send to Peter Anghelides”. 10. When are you going to update your web site to include the book? 9. Who was the Enemy/Grandfather Paradox/Romana/Father Kreiner originally? 8. What do you think of Lawrence Miles’s review/interview/Interference/Alien Bodies/writing, and what has he told you personally about the book? 7. Where was K-9/ Leela/ Andred/ Rassilon/ Engin/ Eye of Harmony/ BabyDoc/ Looms/ Master/ Dark Tower/ Rassilon/ …? 6. Is the book’s plot impossible because it’s based on a paradox? 5. Your book’s wonderful/terrible/mediocre—how did it get commissioned? 4. Why did/didn’t you use/ripoff/avoid/traduce/obliterate Miles’s/ Platt’s/ Cornell’s/ Russell’s/ Parkin’s/ MIB’s/ CE3K’s/ STNG’s/ B5’s ideas for closing/ opening/ resolving/ avoiding/ confusing/ ignoring the arc instead of devising your own? 3. Which parts did Steve Cole write and which did you write? 2. I’ve written a Doctor Who novel—will you read it and tell me how to get it published?